Struggling to keep your blog updated? Or you just starting out and looking for a fresh new blog post ideas? 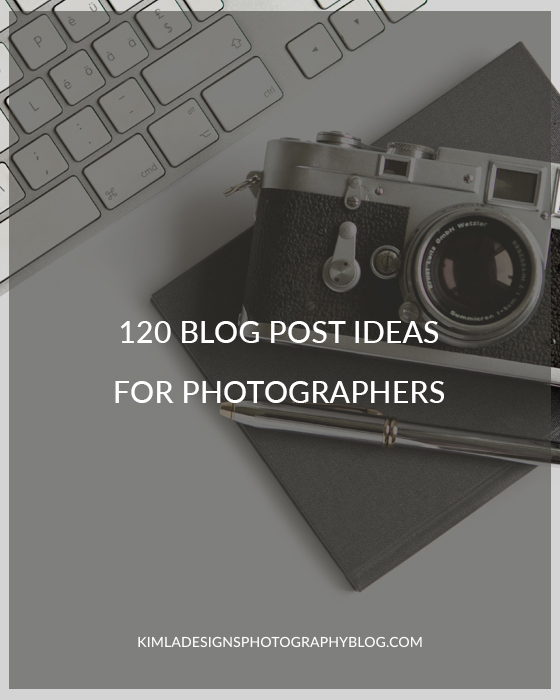 In this post, I will share my 120 Blog Post Ideas for any busy Photographer. This is a whole year of blogging or years if you are into more relaxed and selective blogging. Your photography journey/how it all started. What inspires you to photograph. Why I use this lens. How I edit my photos. Photography classes and workshops I attended. Day in the life of a photographer. What to do before each session-tips for parents/brides/models etc. Why I love photographing kids. Tips for parents with small kids before the session. My favourite locations for a family session. 4 seasons + favourite locations for a portrait session. My photography goals this year. Favourite local vendors, I worked with last year. My favourite time of the day to shoot portrait and why. How I edit my pictures on mobile phone/apps I use. Places I visited over Summer. Camera bag I can't live without. How to feel comfortable during a session. A session with my dog. Why you should print your pictures. Where to print your pictures. Show colour/BW version of pictures. Behind-the-scene photos of you recent session. Best location for any type of session. What to bring for a session with me. My Sunday, show some personal photos. Best poses for family pictures. Your maternity session- what to wear. How I build my portfolio. What I'm doing when I'm not working. Review your favourite photography product. What I listen when editing your session. Announce upcoming mini session offer. How to choose best images. Blog post swap with a photographer friend. What to expect after the session. How I communicate with my customers. Best places for a romantic engagement session. Blog about safety during your session. My best images of the year. Posts about Holidays through the year. Posts about Holiday special offer through the year. Importance of being on the pictures. Instagram and why I love it. Memory keeping why it's important. What colours my camera like the most - tips what to wear. How I will photograph your special event. Why I love a specific type of photography. What I learned this year/month. Me in 5 years, my goals. Kids in motion - tips. Documenting your own life, tips. How I choose the best images and create your gallery. Photography props where I buy them. Why I'm not using photography props. Worst time of the day to shoot and why. Kids friendly locations for a shoot in your area. Make a post with the list of your previous blog post, keep a theme. How to look good in photos tips. What all parents should know before a session. My favourite themed photo sessions. How to pick photos for your family album. What you should ask me before a session. Importance of light, how I pick the right one. Things I wish I had known before the specific session. My best photography purchase review post. Recent photography crush, share your favourite photographers on Instagram. Photography of the town I live in. Share your opinion about photography trend. Favourite thing about being a photographer.